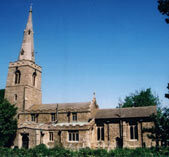 Welcome to the official website of All Saints Church, Little Staughton Bedordshire. Little Staughton is a small village in North Bedfordshire The Church of All Saints is situated on high ground overlooking the surrounding countryside. It is a little way out of the village along Church Lane. At weekends and other special occasions, the Church is floodlit and can be seen for miles around. It has been described as “magnificent” by the Sunday Times and “a true icon of this region of England” (see www.Icons.org.uk). The civil parish is part of the Borough of Bedford while the ecclesiastical parish is part of the united benefice of Keysoe with Bolnhurst and Little Staughton (now suspended). It is in the rural deanery of Sharnbrook, archdeaconary of Bedford and the diocese of St Albans. 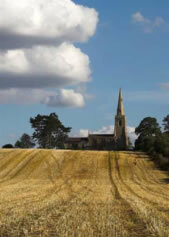 Because we are a rural parish, we aim to reflect the broad church and services are simple. We hold a service at 10.00am each Sunday either at All Saints or at St Dunstan's Church Bolnurst with which we have close ties. If you live in the vicinity or are visiting, please come and join us. We will try to give you a warm welcome! In this website we have included information about the village as well as the church. This reflects our mission to ensure that the parish church, which has over the centuries been an integral part of village life, continues to serve the local community . You can click on the shield to the top left of the menu to access the St Albans Diocese website. You can click on the Church of England logo to access the official Church of England website. 24/6: news section updated. News archive page added.